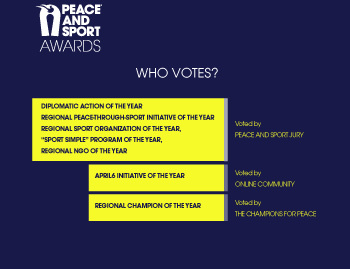 Created in 2008, the annual Peace and Sport Awards reward international or regional organizations and individuals who have made an outstanding contribution to peace, dialogue and social change in the world through sport. This year the ceremony of Peace and Sport Awards will be held in the island of Rhodes, Greece, Thursday 18th of October, as part of Peace and Sport Regional Forum. On this occasion seven awards will be granted to exceptional initiatives promoting peace through sport! The categories of the Peace and Sport Awards 2018 are divided into “regional” and “international”. Only organizations and individuals that are leading an initiative in the Mediterranean and Balkan area are entitled to apply for the “Regional” Awards. Organizations and individuals that are leading an initiative in the rest of the world, shall apply for the “International” Awards. LIST OF THE 2018 NOMINEES HOW TO APPLY? Regional Champion of the Year rewards a regional athlete who has led a significant and sustainable sport initiative towards peaceful change. Regional Sport Organization Of The Year rewards a sport organization (regional, national or local) leading a sustainable program which contributes to the development of social integration and peace through sport. Regional NGO Of The Year rewards an NGO that uses sport as a tool for sustainable peace education and social development and has demonstrated its capacity to involve local stakeholders. “Sport Simple” Program Of The Year rewards a program that uses sport as a tool for peace by teaching positive values such as inclusion, equality and conflict resolution through specific exercises, by applying simplified rules that are adjusted to the specific technical level of participants and/or environment of implementation, or by using sport equipment created from local or recycled material. April6 Initiative Of The Year rewards individuals and organizations who have contributed to the celebration of April6, the International Day of Sport for Development and Peace, through a #WhiteCard initiative or an event raising awareness on the use of sport as a tool for development and peace. Diplomatic Action Of The Year rewards a stakeholder who took significant steps forward in diplomacy through sport.